People often ask me if I make my own bread. Since where I live, within a one block radius of my apartment there are literally four very good places to buy bread that is baked fresh daily (and it’s very inexpensive, around €1-€2 a loaf), although I admire those who do, I can’t rouse myself to bake my own. Yet when I got back from Ireland I found myself craving soda bread something fierce. There’s no shortage of baguettes or other lovely breads here, but Irish soda bread has a certain je ne sais quoi—and I wanted some of that hearty, crumbly bread from the Irish isle. Partially to blame were a few rounds of Irish cheese that I carried back, including a tangy, creamy Cashel Blue, that was begging to be sliced and smeared over some wheaty bread. Plus it was Sunday and the place that makes my favorite Tradigraines baguette was closed on the weekend. So I thought I’d bake up a loaf for myself. Before I go any further, I’d like to get this out of the way: None of the brown breads, Irish soda breads, and scones I had in Ireland bore any resemblance whatsoever to their American counterparts. Soda breads were plain, and I didn’t see any scones overloaded with candied fruits, chocolate chips, or sugary glazes. At most, I saw a few raisins lurking in a scone or two. But all the Irish soda and brown breads I had were on the dry side, and many folks might consider them alarmingly plain. That doesn’t mean they weren’t delicious, but we’re so used to trying to add all sorts of things to make things “better”, or expect things to be “the richest” or “the moistest” or sweetened, that whatever we’re making ends up far from the original. The brown breads I had in Ireland and also had very little salt in them, likely because they were going to be topped with salted butter or cheese. I doubt people just eat soda bread as is why is probably why they don’t load them up with extras. And if you have good butter or cheese around, you’ll find both are the perfect accompaniment and nothing else is needed. Except maybe a glass of cold beer. 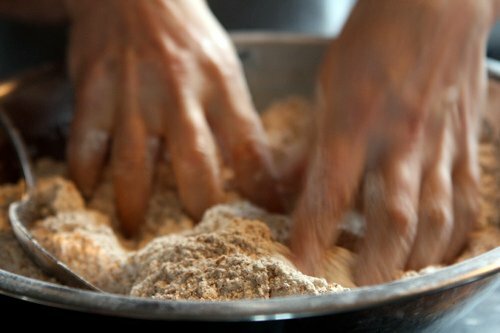 I was fortunate that when I was at the Longueville House, chef/owner William O’Callaghan shared his Wholemeal Brown Bread recipe with me. I’d never heard of ‘cream flour’, which is regular all-purpose flour (although ‘cream’ flour sounds a little more interesting, doesn’t it?) and his original recipe calls for half wheat germ, half bran. Since I had a bag of wheat bran (son de blé) on hand, I used all of that, but feel free to use a mix as he did. But then I started rolling and realized this make one nice-sized loaf, which is enough for a family to enjoy, or a table of guests at your Irish countryside manor. Once again, this is not a refined bread, but meant to be rough, coarse, and earthy. Don’t worry too much if it doesn’t look picture-perfect; once slashed and baked in the oven, it’ll surprise you with how impressive it looks when baked. I also added a touch of molasses to augment the hearty flavor of the wheat, although true soda bread is apparently unsweetened. Some folks add raisins, candied or fresh orange zest bits, fried bacon, or you can use all white flour and make a more refined loaf of regular Irish soda bread. I don’t really know the origins of bread made with baking soda. I suspect it has something to do with the large amount of buttermilk thrown off during the butter-making process and the frugal Irish found a way to use it up. I guess I could go look it up, but I don’t have time. Because I’ve got a big loaf of fresh brown bread that needs my attention. I used T110 flour, which in France, is a light whole wheat flour. 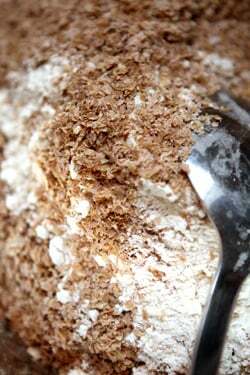 Which is wholemeal flour in Ireland, and similar to whole wheat pastry flour in the United States. You can use whatever is available to you, as making soda bread isn’t supposed to be a stressful experience. Still, the loaf was a bit heavy. So I think next time I’m going to cut the amount of wheat germ or bran in half, or leave it out completely, to lighten things up a bit.I also think the large loaf, while a necessity if you’re running an inn and feeding a lot of people, was pretty big for just me, so I would make two smaller loaves and reduce the baking time to compensate. Irish soda bread should be served the same day it’s made; any extra can be frozen. 1. Put the rack in the middle of the oven and preheat the oven to 350ºF. (180ºC.) Line a sturdy baking sheet with parchment paper or a silicone baking mat and put it on the oven rack. 2. 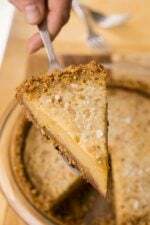 Mix the whole wheat flour and wheat bran or germ in a large bowl. 3. Sift in the white flour mixed with the baking soda and salt. Stir the flours together, to combine. 4. Cut the butter into little bits and rub them into small pieces with the flour mixture using your fingers, until as small as possible. 6. Use a sharp serrated knife to slice a cross deeply into the top of the bread, about 1-inch (3cm) deep. Place the brown bread loaf on the hot baking sheet, being mindful that the baking pan is hot. 8. Remove from oven and cool on wire rack for one hour. *For those who can’t get buttermilk, mix 1 part plain whole-milk yogurt with 1 part low-fat or regular milk and let stand for five minutes before using. If this is as quick as it seems, I must try! And would love serving it with some blue cheese too. huzzah! i was keeping my fingers crossed for a soda bread post. Oh how warm and delicious this looks on a rainy, autumn day in New England. And you have it perfectly paired with the blue cheese and —of course— beer! This makes me miss Ireland something fierce. I just started baking my own bread because I live in the middle of nowhere. So thank you David, I’ll give it a go. This is off your subject but I just read about a new fizzy water fountain in Paris – free – where is it? Perhaps a posting to keep us informed? mmmm… brown bread with a bit of bacon and an egg. Can’t wait to try this!!! The molasses…perfect! I love it when dense breads like this have a slight sweetness to it. Thanks for sharing! This bread looks awesome! 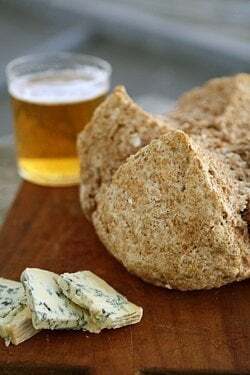 I’ve actually never thought of eating bread with blue cheese, but Ill have to give it a try! Your bread looks wonderful! I will have to give this recipe a try. Darina Allen’s recipes for soda bread are in my opinion the best on the planet. Particularly, her herbed white soda bread, not traditional but fabulous nonetheless. Every time I bake some I wonder why I do not do it more often. I lived in Cork during university! My exchange ‘family’ always bought me brown bread; I’ll have to make this (and gluten-free-ify it, of course)! 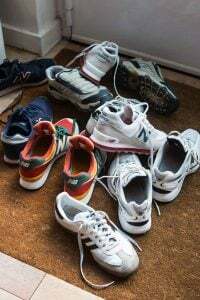 Thanks for jogging my memory. Thank you, David. This officially ends my brown bread harassment of you. Well, except when I comment again after I’ve tried your recipe. Thanks for the great recipe, I’ll be trying that one soon! It’s funny, I ran into my junior high Spanish teacher at a family gathering this month in California, and we got to talking about our trips to Ireland. She discovered brown bread on her trip and complained that she could never find it in California. I’d send her this recipe if I knew how to contact her. On second thought, thinking back to how impatient she was with me and the other students in her class, I’m pretty sure she doesn’t have the patience to bake anything! When you say “wheat germ,” do you mean the wheat germ typically found in the US in glass jars (or bulk) or something different? I can imagine the addition of wheat germ would add to the texture and flavor. The recipe and photos are so alluring, especially that cheese. And I’m glad you added molasses — can’t use it enough! 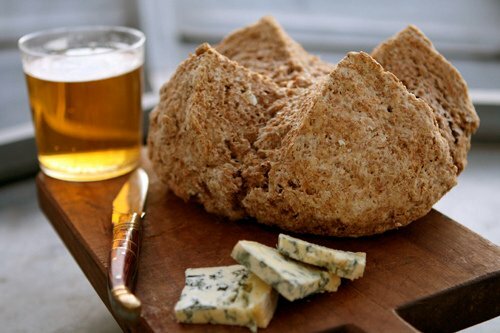 I adore soda bread, but have never made it with whole wheat–very intriguing! Love how you sliced the top! There is no situation in which soda bread is preferable to real bread, it’s dry, and plain. 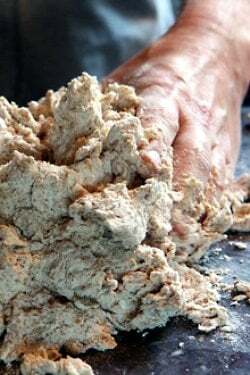 In countries and culinary cultures across the world people ferment and leaven their breads with yeast. It has been done for thousands of years because yeast is bloody brilliant. Only in Ireland do people genuinely believe soda bread is the equal of yeast bread, while the rest of the world sees it for what it really is, not a bread at all but actually a horribly dry savoury cake. Yes it takes less time to make, but that logic advocates using pre-chopped onions or even cooking things with a microwave. We don’t do those things because they make food taste terrible. For the same reason we should either be patient and make proper bread or buy great bread from a bakery. David, this loaf looks like it is a chewy bread, which is my favorite kind, and no yeast for this “yeast-killer” to deal with. I’m a little confused with Step 4 in the instructions. Are we rubbing the butter into the flour mixture? I assume that is the case since nowhere else does it mention adding the butter. Also, if you leave out the wheat germ/bran, what do you substitute – more whole wheat or AP flour? Thanks for the recipe. Please pass the cheese! I’m not a big fan of the soda breads, but I’m always up for a chunk occasionally spread with copious amounts of butter. I am going to make this! Thank you. Delicious looking bread! The best scone I’ve tasted was at Crown and Crumpet in Ghirardelli Square with just a few currants inside. Totally made me rethink scones. Hi, David. I have a go-to brown soda bread recipe that I love, but when I’m cooking for a big crowd, I have to bake two. Next time, I think I’ll try your mondo loaf, instead. Thanks! Salivating as I look at the bread and the Cashel Blue!!! My husband has mastered this, but never thought to have it with cheese – usually slater on the KerryGold! Love the writing you are doing about Ireland. Makes me homesick…. I love the color of this bread. I think I’d just shape it into biscuits and go from there. I love a lot of crust…plus it’s faster. 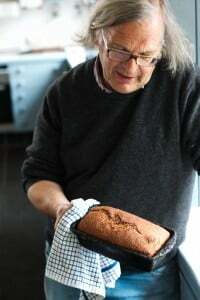 I love Irish Brown Bread– just did a post recently on my go-to recipe. It really is the ultimate quick bread– perfect for dinner or potlucks! I love Anon’s “PRONOUNCEMENT FROM ON HIGH” which reminded me not to be a total grump even though it’s Monday. Lovin today’s post. I actually have in my possession a brown bread recipe for one that can be completely put together in a pint glass…for those moments when nothing else will do… I am really enjoying your Irish posts! Does it NEED to be eaten the first day? The reason I’m asking….I want to match the bread with what I’ll be having for dinner on Sat….but won’t have access to an oven (I will to a bbq though) or time. Thurs would be the only day I could make this. Suggestions please? And also…does it get dry/hard the next day? Is that why it should be eaten the day it’s made? I love soda bread, and have always sworn by St Johns’s recipe (with no butter in the dough) – It’s so easy to dish up with a soup for dinner or for breakfast…and if you have any left the next day it’s actually VERY delicious toasted with butter too!!!! David, you suggest leaving out the wheat germ altogether in the future. Would you replace it with anything else? When I took my parents to Ireland this summer I absolutely fell in LOVE with the brown bread, and worked hard to make it myself at home. I used the recipe from the Ballymaloe Farmers’ Market with a few tweaks and love it – it doesn’t use butter like yours and it’s a wetter batter that is baked in a loaf pan. Yum! Birthday wish came true, BROWN BREAD is the best, so quick easy and delicious! I adore Cashel Blue… truth be known, I’ve never met a blue I didn’t like. Soda Bread, not so sure. I vaguely remember someone bringing a big ol’ loaf to a college beer bash. I recall it being rather bland but maybe that was due to the somewhat deadened condition of my taste buds at the time. I’ve never made soda bread. Since the weather is finally getting cooler (this is our first gray, gloomy, semi-rainy day this fall), I may turn on the oven and give this a whirl. Any thoughts on using white whole wheat flour? Your remark about the scones was astute. I recall having delicate, refined almond cantuccini in Tuscany, and seeing them appear in the US a few years later as “biscotti” – huge of course, and packed with chocolate chips, cranberries, dipped in chocolate or whatever. The American counterpart of many things from abroad seem to be on steroids for some reason. David, I’ve made white Irish soda bread many times but was always fearful to play around with different flours to create a more wholegrained version. I’m going to give your brown bread recipe a whirl this weekend. Thanks for posting it. Here’s a batter bread recipe I created using the remains of a jar of hot mango chutney I found lurking in the back of my fridge. Enjoy! • Stir together flour, baking powder, salt and baking soda together and set aside. 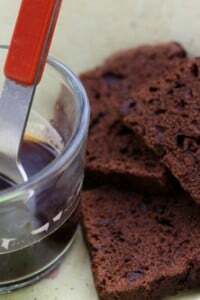 • In a large bowl (or the bowl of a stand mixer) beat butter and sugar together until light and fluffy; about 5 minutes. • Beat in eggs, cream and chutney, scraping down sides of bowl occasionally. • Slowly add in flour mixture and beat until just combined. Batter will be thick and slightly sticky. • Turn batter into prepared loaf pan and bake in preheated oven for 55 minutes or until a toothpick inserted into the centre of the loaf comes out clean. • Transfer baked loaf to a wire cool rack and let rest 10 minutes before removing loaf from pan. • Place loaf on cooling rack and let rest for 5 minutes before slicing. ~ Kitchen musings: If you have an electric hand or stand mixer at the ready this homemade bread can be in the oven in 15 minutes and on your plate in just over an hour. Great served with traditional jams, jellies and marmalades, try slathering still warm slices with maple compound butter for a flavour sensation your taste buds will love. The fact that Irish soda bread is never meant to be eaten by itself reminds me of why plain white rice is a staple in Asia. It is all about balancing the rich flavors for condiments/dishes with the honest and earthy magic of grains. I remember back in college I was shocked to learn about people eating a dish made from just sugar, butter, and rice. Pilafs I could understand in relation to fried rice. On the other hand, the combination of sugar, butter, and rice felt like blasphemy to my Asian roots. A lot of chefs these days try to make every single element in a meal burst with flavor but I find that it sometimes leads to sensory overload. I was overjoyed to see your molasses bottle from my favorite grocery store chain. As always, your posts inspire me. …And I was pleasantly shocked to see a molasses bottle from Publix markets! I was born many decades ago in their hometown of Lakeland, FL and regret that they haven’t made it this far north! Whenever I travel further south I have to wander their lush aisles to see what’s new and different. And there you are…in Paris….with their molasses. You are one delightful surprise after another! I make a lot of yeasted breads but never have tried my hand at soda bread. I have two questions, David. You say you would halve the wheat bran/ germ, so I’m assuming this recipe gives the actual quantity you used. I can see 2 3/4 cups, so I’m assuming that needs to be halved for a less heavy bread. You do say to use yogurt + milk to substitute for buttermilk. Wouldn’t milk + vinegar also work instead of buttermilk? Is the “lait fermente” yogurt? At the risk of sounding really corny, sometimes when I’ve had a hard day and I’m feeling uninspired, I come to your place and I’m ready for tomorrow and a new creative project. Thanks for that. Sincerely. How long will this bread keep at room temperature? I’d like to make it in advance if it won’t sacrifice texture or flavor. This is good timing…you’ve inspired me to cook an Irish breakfast this Saturday, complete with beans, sausage, roasted tomatoes, and your Irish soda bread! I just bought some Kerrygold butter from Trader Joe’s as they still have the best prices for this butter in the area. Now I need to find a good source for Irish sausage. So… I love to add 1/2 to 3/4 cup steel-cut oats (they soften in the cooking but add toothsomeness). Then before I slash the loaf, I roll the entire loaf in the steel cut oats and put extra under the loaf to be baked. It adds lovely texture and presentation! I love to make soda bread at home, it’s always good for those cool fall days. This bread is begging for good Irish butter and some honey, with a tall glass of milk. Very good comfort food. If 2¼ cups = 250g, does 2¾ cups = 280g? I grew up eating plain, light, barely or unsweetened, small and dainty scones in a Commonwealth country, with a simple adornment of jam and cream. Recently, I’ve seen American-style scones pop up all over the place, bursting with chocolate chips and dried fruit. I have tried them on many occasions but found them “eh” worthy. Not really my thing. Too big, too loud, way too much going on, ridiculously sweet, and none of the delicate, flaky texture I’ve come to expect from scones. However, bake me a tray of plain, buttery scones and pass the jam and cream, and I will quite literally eat the lot. I think America has somewhat abused the scone. I do however enjoy American variations of other things. Just leave the scones alone. I love how when people have been in Ireland/around Irish people they adopt the vernacular! I’m lucky to be from a family of really amazing bread bakers – both my gran and aunt made brown bread by eye and never weighed anything. While I don’t have that confidence, I love making brown bread, slathering on the Kerrygold, then lots of smoked Irish salmon with lemon juice and black pepper. ‘Home’ in Ireland is Tipperary and the makers of Cashel Blue, the Grubb family, live a few fields over. 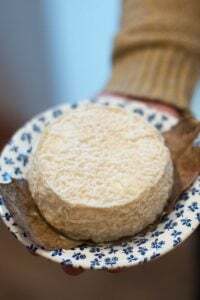 They make a sheeps’ blue called Crozier that is a bit harder to find but also truly amazing if you get the opportunity to try. Thank you, David! You just answered a question that’s been haunting me! My local PBS station recently picked up Rachel Allen and I’ve been enjoying her program. (And what fun it was to read your recent post about cooking with her.) She often mentions “cream flour” and I didn’t know what that was. But now I do! Thank you! Imagine my thrill just now to find out just now that “cream flour” is something that I already have in my pantry! I was converted to soda bread when staying at a hotel in Cork. It was served at every meal, and toasted for breakfast. When staying in the West of Ireland, I had it open faced with smoked salmon and capers. You’ve inspired me to make some. When my husband and I were in Ireland last (2006) we were introduced to brown bread. The owner of the B and B where we stayed made it every morning. It was so delicious. I am going to give your recipe a try. Thanks. Try adding some finely chopped rosemary to the bread. Delicious! Soda bread needs to be eaten on the day it is made, preferably still a bit warm. You can toast it the next day but it is not that great. David, how do you call buttermilk in French ? do you find it in Franprix or Monoprix or similar places and if yes, under what name ? Beebo: I think I would leave it out altogether, and reduce the buttermilk a splash. I don’t think it needs the bran or germ since the bread is pretty hearty as it is. arline: It’s interesting because I’ve never had Kerrygold butter until this trip and it really is as good as the French butter I’ve become accustomed to. Stuart and Maya: Lait fermenté is fermented milk, or buttermilk. They also call buttermilk ‘lait ribot’. There might be a slight difference but I’m not aware of it. I bought this at the Arabic market, which always carries it. Some supermarkets have it, but not all. 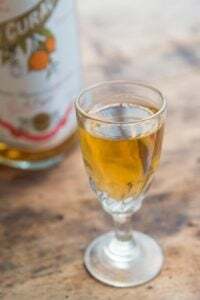 Aparna: Sometimes you can do that but in this case, I think there’s something about the richness of buttermilk (or yogurt) that you don’t get from milk with vinegar in it. But it would likely work. Shira: I’ve not used white whole-wheat flour because it’s not available in France (I think). I’m not sure I understand it since I like the taste, and color, or whole wheat flour, so I just use that. There is whole wheat pastry flour and I think what I used (T110) is the equivalent of it. 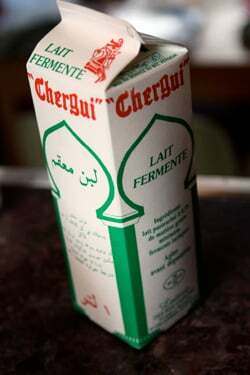 Buttermilk is “lait fermente,” David shows a picture of it and states that he found it at the Arabic market. I love a simple, beautiful, rustic brown bread. Never had the fortunate opportunity to be in Ireland eating a piece – but someday I will! Yours here looks wonderful. Herb butter, an earthy cheese and beer…simply heaven. Thanks for sharing the recipe. Whoops! I published my remark and realized David already answered. I can just imagine how great this bread must be, hot out of the oven, with a nice slather of salted butter. And then, for “dessert”, with some speculoos spread. I’m sensing a bread kick coming along! David, you’re making me miss Ireland even more than I already did. I love it there, and one thing I always make sure to bring back is Irish Soda Bread, I absolutely love it, with some butter on it, I eat it with my morning coffee. If you ask me what Ireland tastes like, that’s what I’ll tell you : Irish soda bread. And the smell of Guinness reminds me of Dublin (due to the smell coming from the Guiness Storehouse, when you’re on the tour bus and go by there, it’s a smell that stuck with me since I first went there in 1999). I can’t wait for my next trip in March, and in the mean time, I may have to try your receipe. I’ve been reading your posts for quite some time, but never commented before, I think. I’m actually French and living in France (in the Paris suburbs, dans le Val d’Oise), and I like reading what expats from the US think of our beautiful country (my husband is American and my daughter is too, as she was born there while I was living over there in sunny Florida). Anyway, thanks for the great posts, and for sharing a receipe I’ve been longing to have. I hope it won’t disappoint. I’m sorry but: since where you live is Paris AND since everything related to food in France is good, I just think you don’t have to spend your time in the kitchen…. But you, better than anyone, know the effect of the smell of fresh bread and the satisfaction of doing a perfect cake or dessert. Just one quick question, how do you carry back with you cheese? Do you just kind of hide it in your carryon luggage and don’t declare it? Ah, thanks so much for posting this! I was visiting friends in Ireland over Easter, and we went through insane amounts of wheaten bread and butter every night. It was so good! I’ll try this as soon as possible. I’m a big fan of powdered buttermilk. Living out in the country, where markets are few and far between, I can store powdered buttermilk for a long time. I add the dry powder with the dry ingredients, and the equivalent amount of water with the wet. Thanks you si much. When I die, I want to go Ireland and eat brown bread. Wait, I don’t have to die to do that, and now I don’t even need to go to Ireland… I just LOVE Irish brown bread but I’d never found a proper recipe. A friend and I went to Ireland years ago, expecting not-great food. We could not get enough brown bread. It was so delicious, plain or with butter. I got the recipe from the owner of a B&B where we stayed, so now I can make it myself. 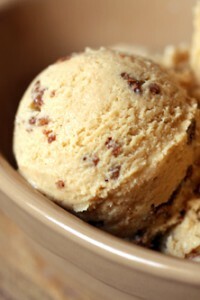 Now if I could just make brown bread ice cream like we got at the mill museum in Lower Slaughter. 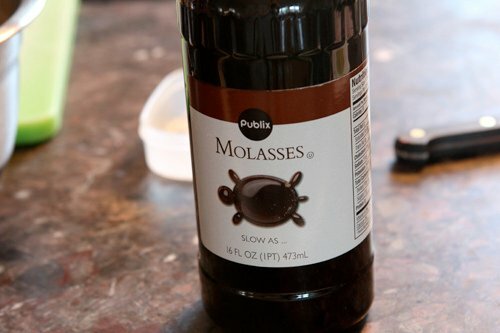 Molasses from Publix??? The best grocery in the world! I grew up in Florida but now live in NYC and the one thing I miss is shopping at Publix… ah memories. The soda bread looks amazing, can’t wait to try it. 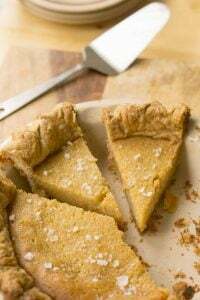 As a novice baker here, you mentioned you might leave out some of the wheat germ but would you replace with more flour or just leave it out altogether? Thanks!!! My Irish father-in-law often made soda bread with the addition of caraway seeds and currants. Try it! It’s delicious! That wonderful looking loaf with some of the Kerrygold and a cuppa. . . sounds perfect. Irish soda bread, brown, is also a perfect accompaniment to good, wild smoked salmon with a smidgen of butter. Marriage made in heaven. 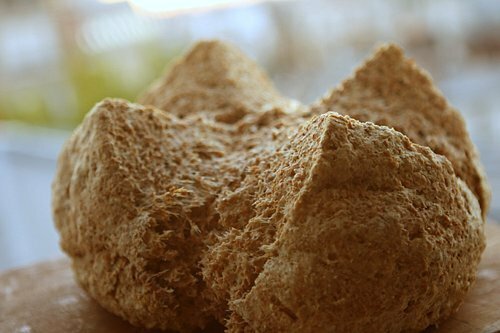 Soda bread is always best eaten the same day, but it can be frozen. It’s true we like our scones simply made, quickly baked and easily eaten! I tried the recipe last night because it happened to go perfectly with the dinner I was planning. I couldn’t find any wheat bran or wheat germ, so I substituted with the whole wheat pastry flour. I think I would prefer to use the recipe as it is written next time, because while it was still delicious, it didn’t have quite enough of the “rustic-ness” that I’m used to with brown bread. Thanks for the fantastic recipe! I did it! 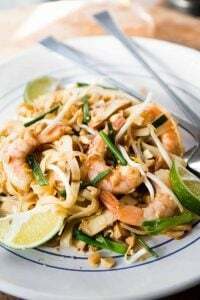 I tried this recipe today and it was delicious. I found a similar flour to what you described, although it was Type 150 and called Farine de ble Complete. My dough was quite dry. Is that normal? I had to add more buttermilk to get it to bind. You mentioned leaving out the bran/wheat germ. Would you replace it with whole wheat flour or eliminate that 2 3/4th cup addition all together? Thanks for sharing that great recipe. Looking forward to your next travels, wherever they may be. erica: In this instance, I bought a snap-tight plastic container and put the cheese in my checked luggage. In France, I have the cheese cryo-vac’d to contain any odors, but I didn’t have that option here. It arrived safe & sound. If I left out the bran/germ, I would likely add a bit less liquid, and not add extra flour—but it’s something I’m going to try next time and can’t say for sure the quantities unless I give it a go. 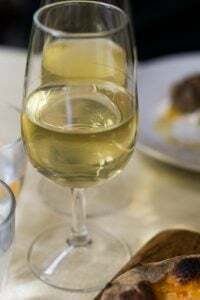 franchesi: Regardez cette liste: Paris Cooking Classes. I tried to make a soda bread once with King Arthur all purpose flour, I wasn’t too impressed with it. Perhaps I will give this a try and focus an topping it with some good cheese! oh, gosh, i’d forgotten how i love brown bread, so, until i saw this clover-leaf loaf. Thanks for explaining Lait fermenté. After 6 years in France, I still hadn’t figured out that it’s buttermilk. Eureka! I only knew of lait ribot, which isn’t exactly commonplace in Grenoble. David, do you have thoughts on which buttermilk would have been used in Ireland to make authentic Irish Soda Bread? Is cultured buttermilk a commercial product, and therefore, more recent then original buttermilk? Amazingly, I have all of these ingredients! I bought buttermilk a couple of days ago because I never have it when I need it and then wondered what I would use it for. Serendipity. And it’s a crummy rainy day – perfect for baking. All I could think about when i read this post was the Dave Chappelle skit where they talked about 9/11 and white bread. Thanks for taking the time to answer my questions and comment on my blog. That’s pretty cool. Was in Metz, France today and came across an Algerian bakery. Reminded my of your Tunisia post. The pastries were very much like the ones you pictured. We are just tickled with your trip to Ireland because it came immediately in the wake of our first trip to the southern part of that beautiful country. Every post you’ve made from Ireland has made me smile in some recognition, and this one is no exception. We knew really nothing about Irish cuisine and so were flabbergasted to see that all the “soda” bread we were served was whole wheat (or “brown”). I too came home with a couple recipes from especially wonderful B&B hosts and have only hesitated to bake since I have to translate their measurements to our less-accurate U.S. measurements. Thank you, thank you, thank you for such treats and happy, happy reminders. Made the Irish soda bread this weekend, came out great. What a nice rustic taste and it was surprisingly light. I did substitute the buttermilk with yogurt and milk mixture and added just a few tablespoons of water. gawd that looks good. thanks for sharing! and making me drool! I just got back from a month in Ireland and i have been craving this bread and butter too! i am going to make a pot of soup and a loaf of bread this evening and pretend i am back there. Thank you! I think brown bread is the best with cheese and grapes on a nice warm day with a glass of wine! I made your recipe for Irish brown soda bread. It turned out great! It was so good, in fact, that I honoured it with a from-scratch vegetable soup created from the dregs of my Community Supported Agriculture baskets. While the ingredients may have been a little unorthodox, the soup, I think, did your brown bread proud. I blogged about both on “Deb’s Daily Dish” Oct 5th post at thefridgewhisperer.com. 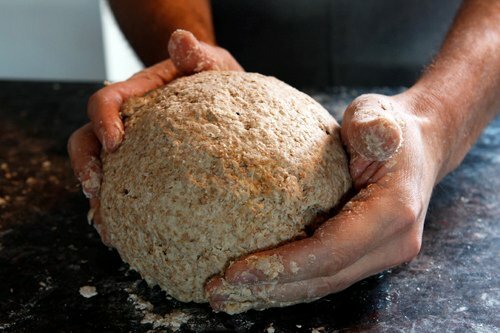 In relation to your bread being heavy may I suggest that soda bread is all in the “hands”! As both a chef and a cookery teacher the photographs would suggest that your dough was too dry. 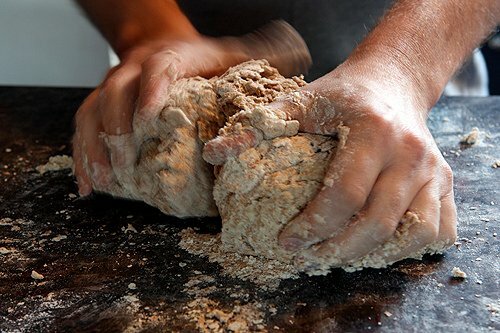 It should be a wet loose dough that is quite sticky to handle. 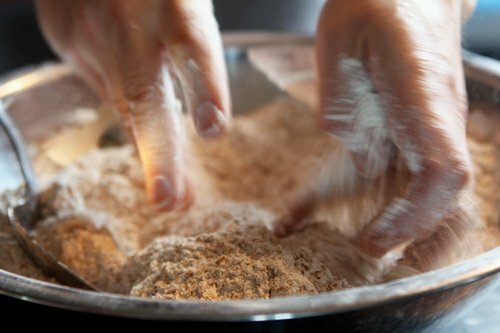 It is also important to make a well in the centre of the flour, after you have mixed the flours and raising agents together, and before adding the buttermilk. Hope this helps! It is lovely to see North Cork protrayed so beautifully. Thank you! I am a newcomer to your blog and have added it to my reader so I don’t miss a post. Both your writing style and photography is beautiful. You effortlessly convey your daily slice of life by talking about the foods you eat while also managing to teach me something in the process (loved the Brie post). Thanks! Thank you for this beautiful photo essay, and the recipes. It’s a gift to be able to make us feel we’ve been there, and you have. I wondered if the bread first pictured, sliced, was Irish Soda Bread? I will make the recipe at the end anyway. The sliced bread shot next to the pumpkins. I guess I travelled so far I got into the wrong comment box. It’s with the shortbread recipe post.